If you're still doing holiday shopping, I've got a couple of ideas for the kids on your list. This week I got to try out two fun children's toys: Gobblets Gobblers & Crazy Forts. Gobblet Gobblers is the junior version of Gobblet, a strategy game like Tic-Tac-Toe, but with a twist. The game board of Gobblet Gobblers is a three by three grid & the goal is to get three of your colour in a row, but the game pieces are cups, or 'gobblets'. Once a player puts down their gobbler, you can put one of your colour over top of it. Each game takes only 2-5 minutes to play, making it an ideal first strategy game, even for wiggly kindergarteners. It's recommended for ages 5-8, with a simple set of rules, this game is great for learning strategy & honing memory. 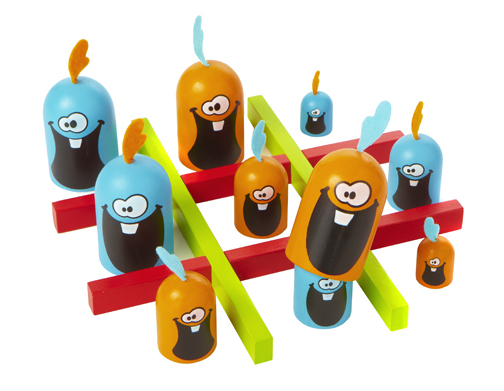 The game itself consists of twelve colourful wooden pieces in three different sizes, half of them orange & half blue. The grid is made up of four wooden bars that you put together on a table or floor to play. I like that it's made of wood, as well as being fairly compact. If you put it in a small bag, rather than the big board game box it comes in, you could take it with you on your travels. The pieces aren't too tiny or easy to lose--it's easy to count up all sixteen parts. Gobblet Gobblers is about $20 & available at toy & game stores or online. The concept of Crazy Forts really grabbed me because of all the fond memories I have of building blanket forts as a child. There's something magical somehow about making a little house with your own hands, even if it is made of blankets. Crazy Forts taps into that love of building little hidey-holes & helps kids improve spatial awareness & hand-eye coordination. You can build all kinds of structures like igloos, rocket ships, castles, pyramids or houses with the pieces. Sounds pretty magical, right? It's quite simple: the set comes with 25 plastic balls that have holes all over them, plus 44 sticks that fit into the holes. Add one of your bed sheets over the top & voila! You have a Crazy Fort. Of course, you could do this with tables & chairs or whatever furniture you don't mind the kids throwing blankets over, but I like the creativity you can use with Crazy Forts. You can do a lot with one set--that's probably enough for a five-year-old. With two sets, you could probably entertain an older kid for hours. Sprout is younger than the recommended age (5+) for the game, but he thought it was pretty neat to have a little custom-built house in the living room in two or three minutes flat. I like the set because when we don't want the house up, it stores away into a box about the size of most board games. Great if you live in a smaller home or for taking to the grandparents' house. Crazy Forts comes in Original (purple & green), Glow in the Dark, Princess (you guessed it: pink) as well as LED Fort Lights (designed to automatically turn off after 20 minutes--brilliant!). Crazy Forts Original set is available at several online retailers as well as toy stores, selling for about $50. Disclaimer: I was given samples of Crazy Forts & Gobblet Gobblers for review. This is not a sponsored post, however. The words & opinions above are my own. Nothing says “best gift ever” like a caribou!